Carly's Manchester United Blog Manchester United Blog: Has Sir Alex Forgotten About Alexis Sanchez? Has Sir Alex Forgotten About Alexis Sanchez? Manchester United are again preparing to make a new attempt to sign Alexis Sanchez from Udinese. It's not the first time they will have shown a great interest in the youngster, as I have reported earlier writing about who Sanchez is and again when Sanchez said he was keen to play for United. 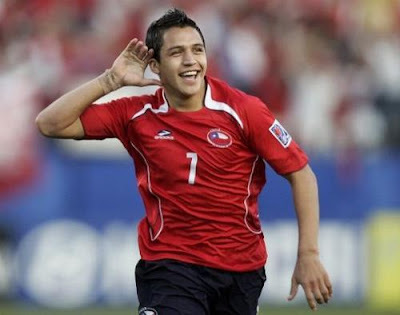 Sir Alex Ferguson has long tracked the forward dubbed 'Chile's answer to Cristiano Ronaldo' and may be forced into a summer move for the 20-year-old as a number of European clubs are preparing to make bids. Udinese are braced for a renewed approach from Manchester United for Alexis Sanchez. The 20-year-old Chilean striker has become one of the most promising youngsters in Italian football, due to a number of impressive performances as Udinese’s number 11.
how much time we have to wait for the buy of the marvel boy from chile??????? c'mon!!!!!!!!!!!! sir Alex please buy him!! and good luck to Antonio Valencia, but Alexis is much better than him, I put my money on Sanchez!!!!! Well, it looks like this is the way it is going to have to be - taking gambles on young players with potential to be 'galactico's'. After all, once Real Madrid have bought every player in the universe with their financial, terrorist attack on football - there is going to be no players left of top repute and ability to buy, only the ones who are not good enough for Madrid. I just hope the Spanish tax payers are going to be happy with their nationally sponsored team of all stars - with no soul. Of course, Fergie will tell us it was always his intention to give Macheda and Wellbeck their chances when every one of his targets is lured by the 'hollywood' of Madrid. Man Utd. now face a massive challenge, the last few years were supposed to be the forming period of a new team with Ronaldo and Rooney as the focal points - the truth is, it is now the re-building starts. Giggs, Scholes, Van Der Sar and Neville will soon be gone, Ronaldo and Tevez have gone, with promising but unproven young players to fill the gaps - has Fergie got time to groom these youngsters into what we need? Do any of them actually look like world beaters? In any other summer Antonio Valencia would have been a great addition to the squad, he will probably now be the biggest name to arrive this summer - straight into the team, to actually replace Nani, who was supposed to replace Giggs - only a Messi or a Ribery could have replaced Ronaldo. The truth is the limitless money of Madrid has rendered us impotent in the transfer market. Against Barcelona we were not good enough, and now, not only have we lost our best player, but any player that might have been brought in to lessen the blow is going you-know-where. Is it confirmed that we are interested in him? Or is it just tabloid speculation? And also, do you have any info about United's reported interest in Toulouse striker Andre Pierre Gignac? Valencia has finally signed with us, but no benzema in the end since he has agreed a deal with MADrid, so this leaves us with very few good players to sign, and as u said sanchez is one, with aguero as well, and may be ribery. But we could also go for Silva, and the Brazilians Douglas and Nilmar. nice blog of ManUTD mate ! Manchester United Fc unofficial blog ! hot news , updated matches , transfers result , all about glory men .. If you agree, comment on my blog or email to me ! the last time united was linked with a chilean was marcelo salas, but lost out to lazio if im not mistaken. anyway, judging from that video he looks like a good prospect.